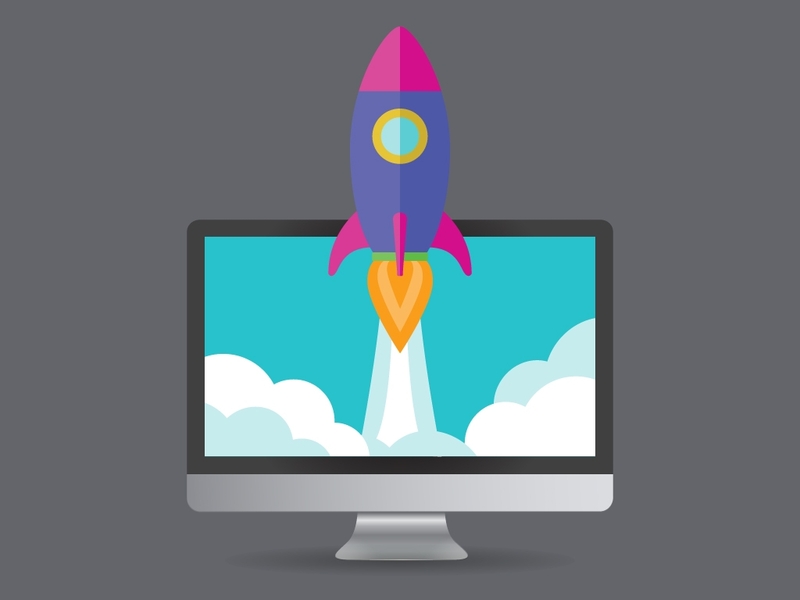 Redesigning and launching a website is no easy feat. There are many factors to consider, including content management systems (CMS), overall design and template theme, mobile optimization features, inbound and content marketing strategies and the effect a new website will have on your audience. 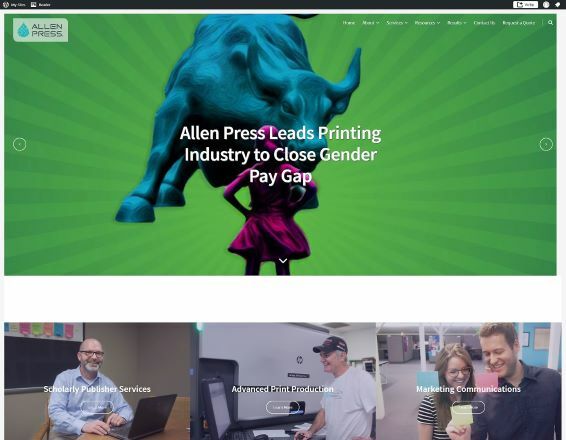 Allen Press moved to a WordPress.com hosted website in 2016 during its corporate rebrand. Since then, we’ve made many incremental improvements, but it was time for a drastic change as our business goals, marketing strategy and brand had outgrown the features and functionality of the site. 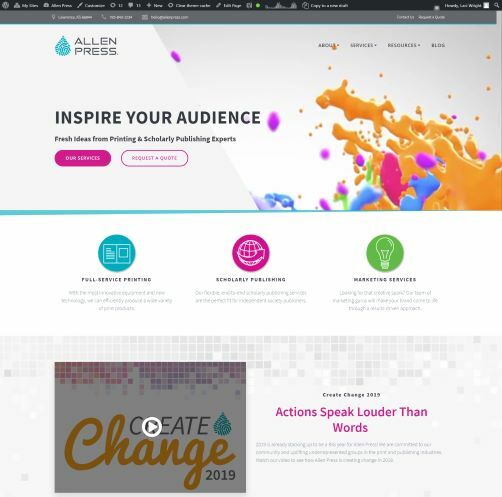 With Allen Press’ newly established in-house marketing agency and the robust features of an internally hosted WordPress.org site, we were ready to take our web strategy to the next level. The previous Allen Press website was hosted through WordPress.com. It was easy to use, provided technical support and operated under the Software as a Service (SaaS) model. With a few clicks of a button, we could easily update pages, add blog posts and customize our site’s navigation. But as our marketing strategy evolved, the WordPress.com site became limited in what we wanted it to do. So we rolled up our sleeves and got to work. With the help of our internal IS/IT department and our team of digital marketers and designers, we relaunched the website in just a few months. 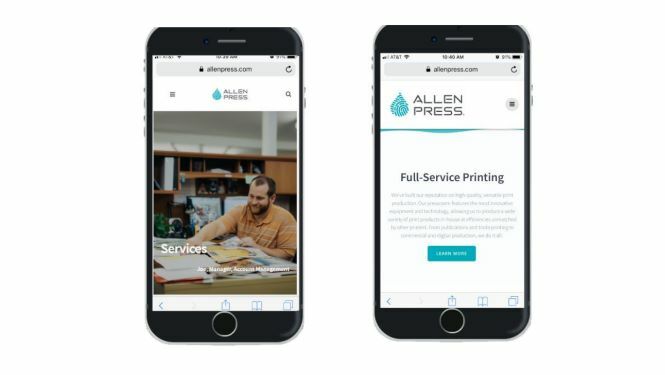 The before and after screenshots of the Allen Press home page speak volumes as to how far we were able to customize the website to fit the personality of our brand. To kickstart the website relaunch project, the Allen Press marketing team completed a comprehensive audit of the previous WordPress.com site and made a list of the shortcomings and “wish-list” features. It was important that the new WordPress.org site facilitate a custom design to reflect our brand identity, provide a library of easy-to-use page layouts and sections, support video content and leverage the power of third-party plug-ins. Plus much more (we had a lot of wish-list items)! While experimenting with different WordPress themes, we locked in on a highly customizable option that would provide both flexibility and personalization. The theme offered all of the functionality we were looking for as well as the ability to edit all content in a drag-and-drop content customizer, allowing our team to easily build each page and see how it would be displayed visually. The drag-and-drop content customizer gave us the option to add page sections with different headers for long-form content pages while supporting a wide menu of page section layouts. This allowed us to create beautiful web pages that were designed to fit the specific needs of our content. The previous Home Page featured a large hero image that pushed the content far down the page. While visually appealing, this meant that users would have to scroll down the page to view our products and services. The revamped Home Page supports video content and call-outs to our services with sleek and simple icons. The theme also features a smaller hero image so that users can easily access product and service pages, view our About page, or request a quote. These tactics are all website design best-practices. The sites may look similar, but WordPress.com is vastly different than WordPress.org. WordPress is an open source content management system, which can be hosted on its servers for a nominal annual subscription fee or self-hosted through your own web servers or a third-party like WPEngine, GoDaddy or Bluehost. WordPress.com is great for people who publish a blog or small businesses that have limited budgets and digital marketing knowledge. However, the simplicity of the WordPress.com platform can soon be limiting to those who want more. This includes site integrations with other platforms, like Google Analytics, Google Ads, MailChimp, HubSpot and other third-party plug-ins. Since Allen Press had outgrown the functionality of its WordPress.com website, we needed to make the switch to WordPress.org. With the support of our internal IS/IT team, we were ready to self-host and relaunch a new website. Note… it’s a huge perk to have your hosting partner and technical team just a few cubicles away! Current trends point to a steady increase in mobile users, and our Google Analytics reports confirmed this information as more mobile users were beginning to access the Allen Press website. Thus, we wanted to make sure the site was mobile responsive, which meant designing for mobile users in mind. With mobile at the forefront of the design process, we customized the site’s CSS to hide larger images as they would push vital content past the user’s viewing area. While we love the imagery, it’s not functional for a mobile session. The new WordPress theme we implemented also allowed us to preview what each page looked like on different mobile and tablet devices. After each page was designed, our digital strategist and designer could switch the preview screen to mobile, ensuring the page was optimized for mobile sessions. The previous Allen Press website was mobile responsive but the mobile design was not customizable. It simply scaled the site based on the device. With the large hero image, content was pushed far down the page and users would have to scroll to find product and service information. The use of video content continues to rise, with almost 81% of businesses using video as a marketing tool — up from 63%, the number reported in HubSpot’s 2017 survey. So, it’s no surprise that companies strategically produce and distribute videos to sell services and tell a brand story. A featured video was added to the new Allen Press home page in order to add a splash of color and movement to the website. This is part of our 2019 content strategy to showcase more videos. The new WordPress theme can easily pull videos from our YouTube channel as well as support embedded videos directly within a web page. Our new video strategy will include more branded stories featuring what it’s like working at Allen Press, behind-the-scenes footage from events and projects as well as animated videos that draw attention through social media. We can take these videos and embed them on different pages to showcase our company culture, products and services and creatively communicate what makes Allen Press unique. This will help support employee recruitment, inbound lead generation and website traffic. As a large commercial printer, we produce some pretty cool stuff. Thus, we also plan to create videos of printed materials being designed, produced, bound and distributed. With the latest print technologies and innovative production workflows, we can create top-quality print materials at affordable prices. Video content will further communicate this message and showcase the capabilities that our modern pressroom has to offer. The new home page features Allen Press’ services, social impact statement and company news. We utilize call-to-action buttons and results-driven copy to help drive users deeper into our site to the information they are seeking. It’s important to remember that your home page is the entrance to your site and should include call-outs for users to find pertinent contact information. Additionally, almost every web page on the new site contains a strong call-to-action section with an embedded contact form or button driving visitors to a specific landing page. By making it easy to contact Allen Press, we hope to increase inbound leads and new business opportunities. The relaunched website needed to creatively showcase the award-winning work we produce for our customers. The section layout included several different photo galleries, optimized to give visitors a sense of our work and capabilities. Through WordPress’ easy to use customizer layout tool, all we had to do was drag and drop – and voila! We could spotlight our client’s outstanding printed materials and publications. Through the use of our client’s work and our superior printing capabilities, we can show website visitors and potential new customers the top-notch quality of our services. Since Allen Press moved its hosting from WordPress.com to its local servers, we were able to download and activate third-party plug-ins for optimal performance. This includes Yoast SEO which we use for SEO and optimizing web pages. The plug-in is easy-to-use, robust and offers marketers valuable information regarding a page’s SEO performance. Through the plug-in, we can update meta descriptions, focus on specific keywords and update the SEO slug and title. Other plug-ins have been utilized to streamline and enhance our digital marketing strategies. This includes customizable contact forms, MailChimp integration for blog sign-ups and automated emails, Google Analytics and Facebook Pixel. Each plug-in works to help Allen Press better understand its audience, enhance website traffic and capture critical business insights. The relaunched Allen Press website was a blueprint for our in-house Marketing Agency as we position ourselves to provide comprehensive web design and development services to our customers. With our team of digital strategists and designers, we have the expertise to successfully launch new and improved websites using our own hosting infrastructure and IS/IT support staff. Have a website that needs a major facelift? Or need help optimizing your site for e-commerce, videos, email integration, blogs and more? Contact us to receive a free website audit!